PI3K-Akt Pathway is an intracellular signal transduction pathway that promotes metabolism, proliferation, cell survival, growth and angiogenesis in response to extracellular signals. This is mediated through serine and/or threonine phosphorylation of a range of downstream substrates. Key proteins involved are phosphatidylinositol 3-kinase (PI3K) and Akt/Protein Kinase B. The origins of PKB/Akt research can be traced back to the discovery in 1977, by Staal and co-workers, which is a previously undescribed oncogene in a virus termed ATK8. And this cell-derived oncogenic sequence were isolated and named akt. In 1991, three independent research teams identified genes corresponding to PKB/Akt. These three cloning papers established PKB/Akt as a novel phospho-protein kinase that was widely expressed, and paved the way for future experiments into the role of PKB/Akt in diverse cellular processes. An enzyme termed phosphatidylinositol 3-kinase (PI3K) had been isolated in 1990 by the group of Cantley. In 1995 Richard Roth and his colleagues reported that Akt was activated by insulin. Then, several researches suggested that membrane phospholipids generated by PI3K were an integral element required for PKB/Akt activation. The key molecules involved in this signaling pathway are receptor tyrosine kinase (RTKs), phosphatidylinositol 3-kinase (PI3K), phosphatidylinositol-4,5-bisphosphate (PIP2), phosphatidylinositol-3,4,5-bisphosphate (PIP3) and AKT/protein kinase B.
RTKs are the high-affinity cell surface receptors for many polypeptide growth factors, cytokines, and hormones. This receptor have three functional domains: an extracellular ligand binding domain, a transmembrane domain and an intracellular tyrosine kinase domain. When the ligands such as growth factor bind to the RTKs, two RTKs monomer get close and form a dimer, which leads to activation of the intracellular tyrosine kinase domain and auto phosphorylation by each monomers. PI3K is a kinase that capable of phosphorylating the 3 position hydroxyl group of the inositol ring of phosphatidylinositol (Figure 1). PI3K consisted of two domains: a catalytic domain P110 and a regulatory domain P85. The activation of PI3K typically occurs as a result of directly stimulated via the regulatory subunit bound to the activated receptor or indirectly activated via adapter molecules such as the insulin receptor substrate (IRS) proteins. PI3K can also be activated by a GTP binding RAS protein. PIP2 and PIP3 are minor phospholipid components of cell membranes. The PIP3 usually serves as docking phospholipids that bind specific domains that promote the recruitment of proteins to the plasma membrane and subsequent activation of signaling cascades. 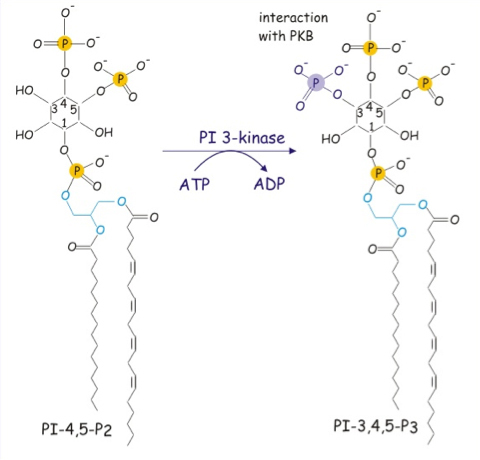 In PI3K-AKT pathway, the 3 position phosphate group of PIP3 can bind to both PDK1 and AKT protein and recruiting AKT protein at the plasma membrane, allowing PDK1 to access and phosphorylate T308 in the “activation loop”, leading to partial PKB/Akt activation. Then the phosphorylation of Akt at S473 in the carboxy-terminal hydrophobic motif, either by mTORC2 or by DNA-PK, stimulates full Akt activity. Figure 1. Phosphoinositide metabolism and the structure of PIP2 and PIP3. AKT also named as protein kinase B, is a serine/threonine-specific protein kinase that plays a key role in multiple cellular processes. Once activated, Akt regulates the function via phosphorylation activation or suppression of a broad array of proteins involved in cell growth, proliferation, motility, adhesion, neovascularization, and cell death. The PI3K-Akt pathway has many downstream effects and must be carefully regulated. Negatively regulation of PI3K-AKT pathway can be achieve at to target: the PIP3 level and the inactivation of AKT protein. Phosphatase and tensin homolog (PTEN) is a main down regulation protein which can converting PIP3 into PIP2. Protein phosphatase 2A (PP2A), which dephosphorylates Akt at Thr308 and phosphatase PHLPP dephosphorylates Akt at Ser473 are also two negative regulation proteins. Addition to these regulation protein, the pathway itself also have feedback mechanisms: Transcription factor NF-κB, activated by Akt, regulates peroxisome proliferator-activated receptor delta (PPARβ/δ) agonists and tumor necrosis factor α (TNFα), which in turn repress PTEN expression as a positive feedback; Negative feedback loop is functioned by mTORC1 and S6K1 activation. S6K1 is able to phosphorylate IRS-1 at multiple serine residues, preventing binding to RTKs, resulting the suppression of PI3K activation (Figure 2). Figure 2. 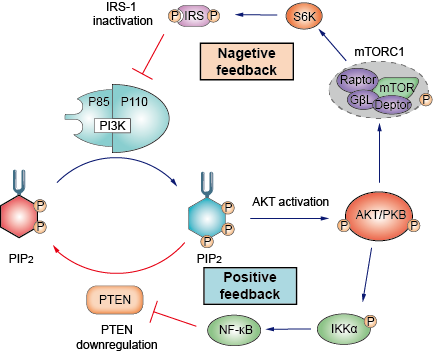 The positive and negative feedback mechanism of PI3K-AKT pathway. Once active, Akt could translocated from the plasma membrane to the cytoplasm and nucleus, where many of its substrates reside. Phosphorylation by Akt can be inhibitory or stimulatory, either suppressing or enhancing the activity of target proteins. Depending on the target protein, Akt can regulate different cell functions, here we discuss several main effect of PI3K-Akt pathway. Akt enhances the survival of cells by blocking the function of proapoptotic proteins and processes. Akt negatively regulates the function or expression of Bcl-2 family members, Bax protein, and Bim protein. Akt also inhibits the expression of BH3-only proteins through effects on transcription factors, such as FOXO and p53. p53 is also an oncogene that mediate cell apoptosis. Akt can promote the p53 degradation through phosphorylation of MDM2. Akt can also phosphorylates GSK3 isoforms on a highly conserved N-terminal regulatory site, and inactivates the kinase, so that regulate the apoptosis and glucose metabolism via GSK3. One of the best-conserved functions of Akt is its role in promoting cell growth through inhibition of TSC2 and indirectly activation of mTOR complex 1 (mTORC1). mTORC1 is a critical regulator of translation initiation and ribosome biogenesis and plays an evolutionarily conserved role in cell growth control. It can activate S6K and eukaryotic initiation factor 4E (eIF4E)-binding protein 1 (4E-BP1), S6K can activate ribosomal S6 and promote the protein synthesis and cell growth. The function of P21/Waf1/Cip1 protein is to maintain the cell in the quiescent state. And P27/Kip2 have a similar function to maintain the cell in G1 state. Protein Akt can also phosphorylates P21/Waf1/Cip1 and P27/Kip2, and inhibits their anti-proliferative effects by retaining them in the cytoplasm. So it can promote the cell into cell cycle to proliferation. In general, the function of PI3K-AKT signaling pathway is to stimulate cell to proliferation and growth, and simultaneously inhibit cell apoptosis. As the general regulation direction of PI3K-AKT pathway is to stimulate the cell growth and proliferation. The over activation of this signaling pathway can over stimulate cell and resulting abnormal cell proliferation, that is oncogenesis. Abnormalities in the PI3K pathway are common in cancer and have a role in neoplastic transformation (Table 1). PI3K itself is a frequent target of mutational activation. The most frequent genetic aberrations in breast cancer are somatic missense mutations in the PIK3CA gene encoding p110α. There are two kinds of mutations of PIK3CA gene, abnormalities of gene copy number and point mutation that resulting the persistently activation of PI3K without the RTKs stimulation. 80% of the point mutation of PI3K are E542K, E545K and H1047R mutation. The patients with these point mutation are insensitive to the targeting anticancer drugs of EGFR and Her2 inhibitor such as Lapatinib and Cetuximab. AKT and PTEN are also targets of frequent genomic and epigenetic change in human cancers. The most common mutation of gene which expresses AKT are activation point mutation and abnormal increasing of gene copy number. The activation mutation of E17L and Q79K are very frequently observed in breast cancer, colon cancer, ovarian cancer and carcinoma of urinary bladder. The common mutation of PTEN gene are abnormal loss of gene copy number and inactivation point mutation, over 10% of patients with endometrial cancer, brain cancer, skin cancer and prostate cancer have PTEN gene mutation. Several small molecules that inhibit the PI3K–Akt signalling pathway are in clinical development. Four main classes of inhibitors are usually discussed: dual PI3K–mTOR inhibitors, PI3K inhibitors, Akt inhibitors and mTOR inhibitors (Table 2). 1. Brazil D P, Hemmings B A. Ten years of protein kinase B signalling: a hard Akt to follow[J]. Trends in biochemical sciences, 2001, 26(11): 657-664. 2. Cho D, Mier J W, Atkins M B. PI3K/Akt/mTOR pathway: a growth and proliferation pathway[M]//Renal cell carcinoma. Humana Press, 2009: 267-285. 3. Hemmings B A, Restuccia D F. Pi3k-pkb/akt pathway[J]. Cold Spring Harbor perspectives in biology, 2012, 4(9): a011189. 4. Engelman J A. Targeting PI3K signalling in cancer: opportunities, challenges and limitations[J]. Nature Reviews Cancer, 2009, 9(8): 550-562. 5. Hennessy B T, Smith D L, Ram P T, et al. Exploiting the PI3K/AKT pathway for cancer drug discovery[J]. Nature reviews Drug discovery, 2005, 4(12): 988-1004. 6. Hers I, Vincent E E, Tavaré J M. Akt signalling in health and disease[J]. Cellular signalling, 2011, 23(10): 1515-1527. 7. Manning B D, Cantley L C. AKT/PKB signaling: navigating downstream[J]. Cell, 2007, 129(7): 1261-1274. 8. Osaki M, Oshimura M, Ito H. PI3K-Akt pathway: its functions and alterations in human cancer[J]. Apoptosis, 2004, 9(6): 667-676. 9. Song M S, Salmena L, Pandolfi P P. The functions and regulation of the PTEN tumour suppressor[J]. Nature reviews Molecular cell biology, 2012, 13(5): 283-296.